This package was approved by moderator gep13 on 2/14/2019. 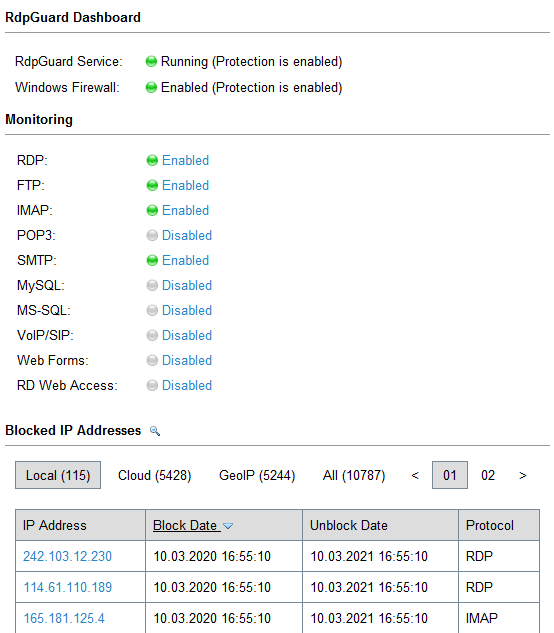 RdpGuard is a host-based intrusion prevention system (HIPS) that protects your Windows Server from brute-force attacks on various protocols and services (RDP, FTP, SMTP, MySQL, MS-SQL, IIS Web Login, ASP.NET Web Forms, MS Exchange, RD Web Access, etc). Copyright © NetSDK Software, LLC. All rights reserved. This discussion is only about RdpGuard (Trial Install) and the RdpGuard (Trial Install) package. If you have feedback for Chocolatey, please contact the google group. Tell us what you love about the package or RdpGuard (Trial Install), or tell us what needs improvement. Deployed from e27d7a207f. You are on web.3. UTC time is currently 25 Apr 2019 01:10:06 +00:00.